"EBAY. I'm a pro! When I shop for baby clothes, it's NWT (new without tags) or EUC (excellent used condition). There's nothing about gently used baby clothes that's gross to me"
Budget friendly fashion diva Olivia had a tough time picking which <$20 item was her favorite so she sent three. Oooh! I love these Nine West booties O. picked up for $19.99. This item wasn't just under $20, it was free! Olivia gets a lot of use out of this fabulous leather jacket her mom wore in high school. For me, I would say the Armani Exchange jacket/blazer I picked up at Goodwill a few months back. It seems to be so versatile (works with jeans, slacks, dresses, etc.). I also feel like the fabric is rather season neutral. And it was $5.59! For next week: What's your idea of a fun date night (or daytime activity) that costs less than $25? (Yes, I realize that photos may be tougher for this one — but try away!). Send your submissions to lifefulfilledatl@gmail.com by Wednesday, November 4. Mistake #1: buying a pair of different sized shoes on Saturday. Mistake #2: talking on the phone and browsing the racks before trying to return the shoes. Smart move/mistake #3: finding some awesome items before turning in the sad, unmatching shoes. Rats. I went to return my shoes and drafted this post before I saw Traci's comment that her restaurant recommendation (Panahar) is in the same shopping center as the BuHi Goodwill. Boo! I popped into the LaVista Road/Northlake Goodwill tonight to return my two different sized shoes only to see an unfamiliar layout. "This isn't how the shoes were arranged on Saturday, I thought to myself..."
Well, they weren't arranged that way on Saturday because I wasn't at the Northlake Goodwill on Saturday! I was at the Buford Highway one. Doh! I went ahead and asked the gal behind the jewelry/high-end purse counter what I should do about my mismatched shoes. She is pretty sure I can take them back and point out the different sizes... for at least store credit. I'm enough of a regular that store credit is fine with me. While I was there, I went ahead and a quick drive-by of the dress section. This blue and beige safari-ish print dress was calling my name. I didn't try it on (too much in a hurry to get to the DeKalb Farmer's Market) but when I saw it's collar and belted waist, I knew I had to have it. 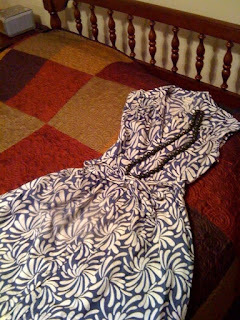 I'll look forward to wearing Merona (Target) dress when the warmer weather shows up (April?). 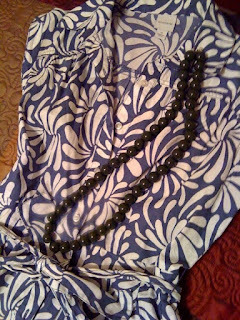 Since I was checking out at the jewelry counter, I picked up a dark green, lucite bead necklace that ought to pair well. And remember to send in your submissions for Audience Participation Friday! What's your favorite item in your closet that was under $20? Send to lifefulfilledatlanta@gmail.com (and pictures are encouraged!). 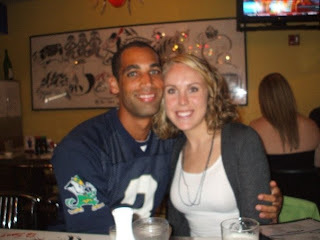 We were on our way to Roswell Road location Alexis Suitcase when our plans were derailed — derailed in a good way! I got a call from my brother's girlfriend Becca. She was a little behind in grabbing a costume for a Halloween party on Saturday night. She said she knew I was familiar with the local thrift and secondhand and wanted to know if I could do a little shopping with her. Little did she know that we were out-and-about on a similar path. So, Lauren and I switched gears a bit from checking out higher-end secondhand shops to seeing what was culminating at one of our local Goodwills. I'm glad we stopped by! Becca dug around for an SNL skit character costume while Lauren and I were distracted by the shoes. It was shoe jackpot day at the Buford Highway Goodwill. Either someone with really great taste passed away unexpectedly or a local fashionista unloaded a surplus of shoes right at our feet. Too bad most of the shoes were a size 5.5 and 6! But no joke, some of the shoes were brand new (no scuff marks to be found) and from fantastic designers ranging from Guess to Steve Madden. We also saw casual brand pairs (e.g., Old Navy) and some not-so-familiar names that happened to have fantastic looks. And all for under $15.00! If these shoes (or any pictured, for that matter, had been in my size, they would have been SO mine. Love love love). Lauren was trying to "behave" for the rest of the weekend in terms of spending (a decision that could rub off on many of us) so she made the decision to leave empty-handed. I felt like I had to leave with something (especially to make this particular blog post more fun) so I grabbed a pair of AWESOME red bootie stilettos. LOVE them. That's right. When I got home, I realized one of the shoes was a size 8 (fit) and the other was a 7. Super lame. Argh. I'm so disappointed. I had big plans for these shoes! I was going to wear my new burgundy tights with them... and pair them with fun black dresses or patterns. Oh well. It's over. Moving on. At least I snagged this fun pair of earrings and this silver brooch (it looks gold but it's silver). I'd love to find a rhinestone brooch to go with my new My Sister's Closet dress, but this brooch MAY work with that purple or beige satin ribbon that I'm envisioning. Take that people who don't think that they could ever shop at the likes of a Goodwill or Salvation Army... Give it a shot, ladies and gents! Goodwill was great as always — and Lauren and I delay our gratification for Alexis Suitcase until her next visit. Hey, it never hurts to spread out the spending, right? Oh, and of course it seemed like a good idea to polish off our shopping with a little Yogurt Tap action. Mmmm. The caramel apple (tasted more like apple pie) was delish. After much oggling over Cliff Bostock's personal Top 10 Atlanta Restaurants, I knew I had to check out C'om Vietnamese Grill. Not only do I covet all of his dining experiences (I just can't afford most of them myself), I haven't had Vietnamese in WAY too long. On top of an intense yearning for a vermicelli rice bowl, I found out my friends Marnie and Lauren were Buford Highway food virgins. We had to go their for Saturday lunch! The first address that popped into my google search was the Dunwoody location. Well, turns out that location isn't open until dinner on Saturdays. Fail. Lucky for us, the Buford Highway location was only about 5 miles and 10 minutes away. After some mild frustration, we all arrived safely at our destination. We looked at each other pensively as we parked in front of the Chevron gas station, within feet of a burger king. The outside of the strip mall restaurant left something to be desired. The bright, almost cartoony panels plastered on top of the windows were reminiscent of Japanese candy and snack packaging. We have arrived at C'om. The interior, however, was a little more luxe than the pump stations, cracked cement slabs and nail salons in the immediate vicinity. We set our eyes on a mostly burgundy dining room with about 15 to 20 tables. To my maybe ignorant surprise, we only saw two tables (out of seven) with Asian patrons. And so we sat. Lauren has tried (and enjoyed) Vietnamese in the past but this was Marnie's first time. We flipped through the simple, straightforward Vietnamese/English language menu. Appetizers were in order. Because we already had a decent idea of what we wanted to order as entrees, we went with a different meat in our appetizer. Beef spring rolls. The spring rolls and sauce included a great balance of spices, acidity, char and heat. We particularly enjoyed how well the beef was cooked — with a nice smokey flavor grilled just enough. Our $4.00 appetizer was scarfed up in moments. Beef spring rolls were a hit with our group. Lauren and Marnie ponder the flavor profile differences among different types of Asian cuisine. Just kidding. We were probably talking about high heels or Halloween costumes. Cliff mentioned the grape leaf bún as one of his favorite entrees. All deciding that his taste must be good (and that the vermicelli salad/noodle bowl description sounded rather divine), we three ladies opted for three different variations of the bún. I went with grape leaves stuffed with duck variety. Lauren, the pork tenderloin. Marnie had the lamb. We voted "yes" for the bún at C'om Grill. What fun it is to stir up a big bowl of Vietnamese bún. First you notice the meat on top. After you pour your fish sauce on top (it's less scary than it sounds, I promise), each turn of the fork reveals more diverse ingredients. Noodles give way to shredded lettuce that give way to petitely-sliced fried onions and crushed peanuts. Each bite was surprisingly complex. It wasn't until about halfway through that Marnie mentioned tasting a hint of mint along with the cilantro and garlic. Yum. We were all happy with our selections. I ate most of it, but I felt that my duck was gamier than expected. The lamb was the clear winner at our table. I thoroughly enjoyed the flavor of the meal but also enjoyed that I left the meal feeling satisfied but not overly full (unlike Chinese food, even good Chinese food). The total bill was also a winner — under $10 (plus tip) per person for a split appetizer and an entree each. We didn't partake at lunch, but our server told us that C'om does have a full beer and wine menu. In advance of her visit, friend Lauren agreed to my "let's go check out some consignment and upscale secondhand stores for my blog" plan. (Thanks, Lauren.) So at 10:30 on Saturday morning, we headed in the direction of Chamblee, Georgia. For those of you unfamiliar, if you thought of 285 as the face of a clock, Chamblee would be just south of 1 o'clock. The destination: My Sister's Closet (5350 Peachtree Rd. ; Chamblee, GA). To be honest, the first two minutes in the store gave me a so/so vibe about the place. Some front-of-the-store items looked less young than we'd envisioned. And we hoped that the first item we picked up (a pink Dana Buchman trench coat) didn't have a price ($180) reflective of the rest of the store. Would the rest of the store be expensive and stodgy? 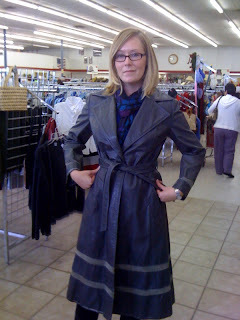 Lauren models the Dana Buchman trench (too big... and a lot too expensive). Good thing our first impression was wrong! We were given a quick rundown of the store by Tee, the fabulous and fashion saavy owner. While pointing out the shoes, purses, hats, furs, vintage duds and other clothing, Tee shared a little background on the shop. Many of the items were gently loved (versus previously worn) and some items may have been worn by their clothes horse previous owners only once or twice before showing up in My Sister's Closet. Lauren and I spent the most time in the shoe and vintage sections of the store. Tee let us know that she's been doing more in the vintage clothing arena. And she had some fabulous items to boot! Fedoras, fur stoles, maxi dresses and more — this area was a lot of fun to explore. The shop is bigger than it looks with many eclectic and fashion-safe items to choose from. In my opinion, these were the find of the day. Never-worn, plaid, platform Michael Antonio heels for $20. New shoes by this guy are $55 and up. Lauren had to take these home with her. One of the vintage shoe sections. Oooh shoes from Gwen Stefani's L.A.M.B. line (I was too nervous to ask about price). I think I could be a hat girl... maybe not this hat... hmmm. Lauren, are you regretting not buying this super cute early-90s Express dress for $18? Super cute. Lauren and super cute dress, pictured with shop owner Tee. I bought this deep purple (lined) vintage velvet dress with a cinched waist ($34). I didn't buy the white belt — hoping to instead snag a purple or beige satin ribbon and brooch to secure it with. I feel like this is evening wear for Mad Men's Joan. While Tee said they carried items "ranging from two dollars to two thousand dollars," we didn't see many items in the under $20 price point. We did see some fantastic high-end items such as some L.A.M.B. platforms ("straight off the runway in New York"), barely used Louis Vuitton purses and designer costume jewelry. Yes, there was a variety of casual and sportswear from the likes of Banana Republic, J. Crew and Ann Taylor Loft, but I'd stick to The Nearly New Store and its prices for those items. The real fantastic finds here are the vintage dresses, footwear and accessories (the belts and hats were rather fabulous). I'm a sucker for all of these (and would like to see what else Tee brings in), so I'll be back. Lauren also gives a two thumbs up. I finally got to wear the wool skirt I bought at Last Chance late last spring. This is actually a revised version of what I ended up wearing, as my morning attempt was a MASSIVE fail. Well, just the upper half of my body was a massive fail. I'll explain. I thought this skirt would be perfect with simple, fitted, white button-up shirt. Earlier this month, I bought one that I thought fit the bill. Nope, didn't work. Once I got to work, I saw that the shirt was too ornate for the skirt (too much ruching, buttons were kind of a yellow-ish color, etc.). And the collar didn't lay right. Needless to say, there are no photos of that version of this outfit. Why don’t we try something new? How about a little Friday segment called “Audience Participation Fridays?” I’ll ask a question and you guys submit your answers (photos encouraged!) to me at lifefulfilledatl@gmail.com. I’ll post some of your “show and tells” the following Friday. I’ll be taking submissions through Thursday at 5pm so I can post about them on Friday. I would love to hear from you (plus, if you’re a blogger, this is a good opportunity to plug your blog on my blog). Calling all Starbucks Pumpkin Spice Latte drinkers. Dunkin Donuts is now serving a pumpkin latte that's just as delicious but friendlier on your wallet. Smalls are just 99 cents! (Apparently I'm behind the curve. My friend Kate tells me that the PSL at Dunkin has been her favorite fall item for years! Also, I'm not loving that PCs don't have automatic spellcheck built in. This teeny little post had TWO typos. The horrors. Because this post (borrowed from JessicaShops) continues to get lots of hits each month, I decided it would be fun to review a few of these consignment and upscale secondhand shops. So this Saturday and/or Sunday, my good friend Lauren and I will be hitting up two shops. Stay tuned for reviews and photos. And if you have suggestions about which would be smart to visit (or if there's one you're dying to know more about), let me know! When the hubs and I went out of town to celebrate our anniversary, we planned to do a little hike around the north Georgia mountains. When the weather didn't cooperate, we opted for a movie instead (no complaints here, as we don't actually go to the movies as much as I wish we did). Dan probably wishes it had been sunny that day. A few minutes into "The Informant," I quietly proclaimed to Dan that I recognized one of the actors as the very same guy who played Biff Tannen in the Back to the Future series. Dan absolutely did not believe me and even suggested we bet $100 on whether or not this guy was indeed Biff. I shook his hand, never having been so sure in my life. Flash forward three weeks. I decided to seek out a strand of pearls in the $80-$120 price range. Every gal could use a nice strand of pearls (classic, beautiful and glamorous are just a few words I use to describe pearls). We received a "20 percent off" coupon for Macy's in the mail this week, too. A sign? I thought so! So, while visiting our friends James and Lauren in Columbus, Georgia, this weekend, I suggested to Lauren that we swing by the mall. We couldn't have picked a better day! The signage at the jewelry counter read, "50 percent off." I tried on a few strands of pearls, eventually settling on an 18-inch, 7.5/8 mm strand originally marked $260. After applying both discounts, the strand set me back a rather reasonable $110. Never the one to waste a trip to the mall, I asked if we could browse some of the nearby stores for patterned and colored tights. Express had some cute ones that were $12.50 each (plus buy one, get one half off). Unfortunately, few were left in my sizes except for boring black and grey. We meandered down to New York & Company. Cute tights, not all that impressive of prices (I think these were $12.50, too). Dillard's was the jackpot. I bought a pair of crimson tights and a pair of black ones with a brown and grey argyle pattern. Can't wait to wear those this week. Yes, I can do math. I'm perfectly aware I spent just a **few** dollars more than what the bet won me. I'll consider it "interest." About a month ago, I read a Web article that featured Love, Maegan and her favorite date outfit. The piece also featured a few other fun and fearless fashion bloggers (Rats, I wish I could find the article!). Well, ever since finding her, I've had a major blog crush on "What I Wore" and its creator, Jessica Schroeder. Jessica pairs thrifted with new, altered with off-the-rack, modern with vintage, conservative with far out. You get the picture. She also offers up tips on how to maximize your wardrobe and step out from the mundane. I especially covet Jessica's tights, vintage dresses and shoes... okay, actually everything. And as one of my friends put it, she just seems to know a lot about fashion and what's flattering (whether it's the fabric, the cut or the pattern). She has 162 pages of posts over the last few years. Don't skip any of them. Enjoy! When we departed for my grandparents' 60th wedding anniversary in Holland, Michigan, I had no idea Saturday would turn into a thriftravaganza. You see, over cocktails and barbeque Friday night, I learned that my Aunt Janet might be the thriftiest lady alive. "Everything but my underwear and shoes I buy secondhand," my aunt proudly shared. And proud she should be! With her immaculate (and cute!) $3.00 khakis, $2.00 sweaters and even a $1.50 Banana Republic suit, she is my hero! We decided right away that we must check out Holland's finest in thrift, consignment and secondhand. My brother Paul and cousin Maureen didn't have to be convinced. They would be along for this ride. (Also not purchased but fun to try on...) Eat your heart out, Brad from Rachel Zoe. Totally Paul's style... I think this is a Brooks Brothers button-up and it was around $4.00 (Ditto in Holland, Michigan). Paul's big find: a Top Gun-era leather jacket (worn in just right). He paid $16... but this should be a priceless piece. Reed jacket found at Ditto. Nice, feminine tie sweater on Aunt Janet (I think $3.00? at Ditto). 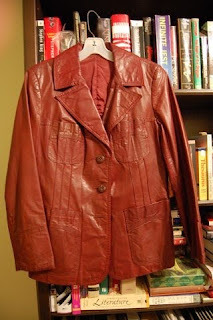 Paul may disagree, but I think this 70s-era 100% leather and suede trench was the find of the day. The label says "Montgomery Ward" — and the piece is in great shape. $15 at Salvation Army. I can't WAIT to wear this. Credit must be given to Aunt J (she found this but it was a little too short in the arms for her tall frame). Perfect, lined Isaac Mizrahi for Target pencil skirt (you can't see in this photo, but the skirt is a textured cotton/chiffon blend). $4.00 at Holland's Salvation Army. Strange man in red shirt sold separately. This photo doesn't do justice to Janet's belted, vintage Liz Claiborne dress (I think $6) from Salvation Army. Mint condition and it fit like a glove! She's not wearing any new buys, but I had to throw in this photo because Anna's looking ferosh in her Dress Up Boutique slate dress ($31) and my Mercedes Bien elastic belt ($18). What a great weekend! Beyond the fantastic thrifting, we very much enjoyed celebrating my grandparents and the love they've shared for 60 years. Congratulations, Jack and Bette!